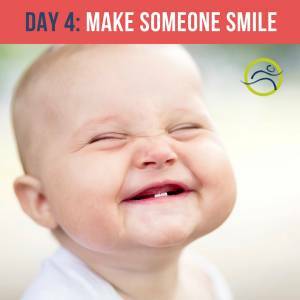 Leduc Physio - Physical Therapy and Massage Therapy ServicesPhysiotherapyUncategorizedMake Someone Smile! Leduc Physio’s 5 Day Happy Challenge; Day 4: Make Someone Smile! Smiles are infectious. To accomplish this challenge you will need to make a point of smiling yourself. Even if you don’t feel happier, the people around you are more likely to smile which can improve your mood as well. Getting someone to laugh is an easy way to encourage a smile. Leave them a funny note, tell them a joke, or do something silly. We have heard “Laughter is the best medicine”and it is true! Laughing and smiling brings people together and triggers healthy physical and emotional changes in the body. It strengthens your immune system, boosts mood, reduces pain, and lowers stress. You could make a new friend by doing so! Take a photo or short video of you and a coworker, friend, or family member smiling and/or laughing! Post it on Facebook, Instagram, or Twitter with #leducphysio5daysofhappy and @LeducPhysio to qualify for the prize at the end of the week! Pain Free Gardening this Spring!